Older iPads may require different adapters to the ones described below. And the new iPad Pro (3 Gen) uses a USB C cable, so the adapter needed will also be different. When it comes to connecting a MIDI keyboard to an iPad, most people ask the obvious question, what cables do I need, etc. to make the connection? Does Your MIDI keyboard Have Its Own Power Supply? The main consideration to be aware of is that an iPad running on battery usually does not have enough juice to power both itself and a MIDI keyboard. then you can use any of the various cable / connection options available from Apple. For example, you can connect a MIDI-to-USB Cable or USB 2.0 cable from the back of your MIDI keyboard either to an iPad Camera Connection Kit or to a Lightning to USB Camera Adapter and then plug that into your iPad. If you happen to already own one of these adapters / kits, great. Just use that. then it typically draws its power directly from a usb port, e.g. when used with a computer it draws its power from a USB port on your computer. If you want to use this kind of keyboard with an iPad — you can, however your Apple accessory options are slightly more limited. 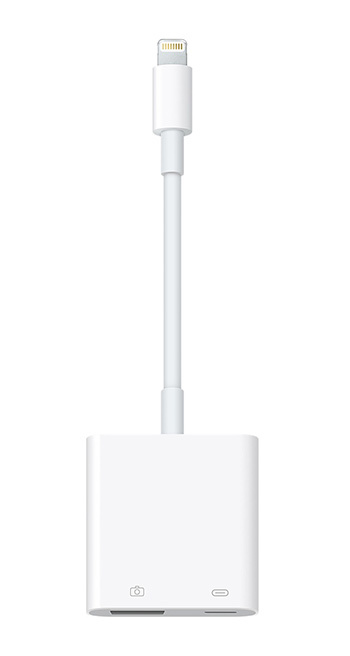 At the time of writing, the option I suggest is a Lightning to USB 3 Camera Adapter (pictured above). In this case you would connect a USB 2.0 cable from the back of your MIDI keyboard to the Lightning to USB 3 Camera Adapter and then plug that into your iPad. And to provide enough power to run both the iPad and your MIDI keyboard, you would also connect your iPad power supply to the USB 3 Camera Adapter. This particular adapter is, in my opinion, the most versatile of the Apple adapters available at the time of writing as you can use this cable with any MIDI keyboard whether or not it has its own power supply. So even if your MIDI keyboard has its own power supply as per Scenario One, if you do not currently own a Camera Connection Kit / Adapter, the Lightning to USB 3 Camera Adapter is the one I suggest. Another benefit of using the Lightning to USB 3 Camera Adapter is that your iPad will be continuously charged, whereas if you run it on battery, you’ll need to charge it in advance. Disclaimer: iPad connection options are evolving all the time. If in doubt, please remember that Apple are the experts on Apple connectors, so they are the best people to advise you on the appropriate connectors between your MIDI keyboard and an iPad. Is It Possible To Connect A MIDI Keyboard To An iPad Wirelessly? Yes, there are some emerging products that will allow you to connect your MIDI keyboard wirelessly to your iPad via Bluetooth. I hope the above information is helpful, and if I can be of further assistance, please feel free to comment below or contact me directly. Piano Lessons Or Keyboard Lessons – What is the difference? Can You Learn To Play Piano / Keyboard On An iPad? Bluetooth & MIDI Latency – Are There Better Options?